Gunner armor is metal, but has a different look than the other classes. There are only a few styles – 3 or 4 – that you will see, but the colors differ. Here is the bare midriff style. In addition to the new armor look for Gunners, there are about 3 weapon styles we’ve seen so far. The first weapon in Island of Dawn looks like a stubby derringer. The second weapon looks like a pistol, but pretty soon a Big Freaking Gun shows up with a mean look. I had built up quite a pile of Fed Bills just from logging in, and then I saw that the Fed Bill store would exchange Fed Bills for Fashion Coupons. So I was able to purchase fancy – 600 FC – armor for my Gunners. 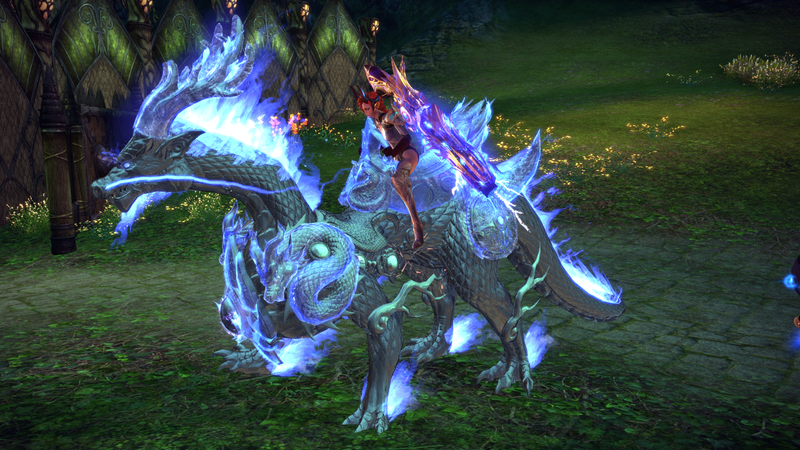 There has been a special event going on to Kill BAMs, collect letters and get a mount. It turns out that you can kill any BAMs, no matter how low a level and the letters can be shared account [same server] wide. So I took a high level toon to a Basilisk area near Chebika and farmed for about 4 hours to get all the letters. 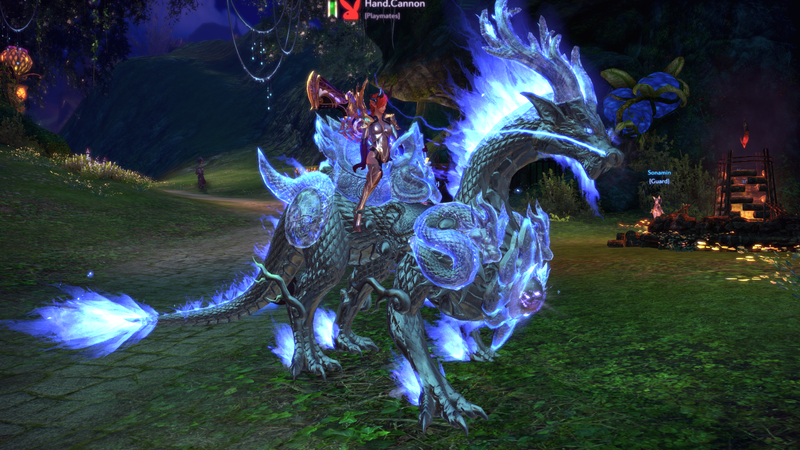 I did this twice, but will sell the second mount on the Trading Post. The last I looked the prices were dropping from 9800G to 7000G so I’ll wait until after the event to sell my second mount. The mount is large and a bit unwieldy. I like Sparky the Raptor a lot better. Recently Tera has been upping the rewards. For various area quests and for some leveling achievements, toons receive crystals. These tend to be damage crystals and armor crystals. Sometimes there are swiftness crystals. I have used exclusively HP / MP boost crystals with a single swiftness crystal [Armor out of combat / Weapon In Combat]. The swiftness crystals do not stack. As it turns out the HP boost crystals are not needed on your armor since at level 28 you get a healing bot. But the MP boost crystals for your weapon are essential. The Gunner quickly runs out of MP if you don’t use these MP boost crystals. Here’s my loadout. My Elf has reached 44 and my Castanic has reached 42. Gunners are the easiest class to solo. And with the double EXP event over the past few days, things go particularly fast. The healing bot you get at level 28 is a large boon. Yesterday I took both gunners through Cultist Refuge Dungeon with teams of other gunners. We found that four gunners and a lancer tank can take the dungeon without a healer. The tank needed to watch it, but the gunners did not need healers and we took down the bosses in the fastest times I’ve seen for toon at the appropriate level for the dungeon. I would guess the gunner skills are due for a nerfing soon, but they have been played in KTera for some time and we did not see a nerf, so perhaps they will leave the gunner in it’s current slightly overpowered design.